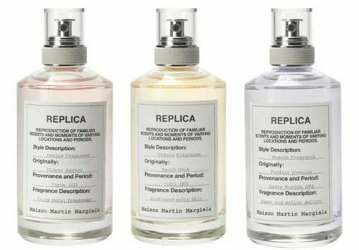 The Maison Martin Margiela Replica fragrance collection has been available in Europe for a while, but it just arrived in the United States this spring. I've made some strategic visits to Sephora to sniff and spritz (and to request samples! ), and I'm ready to share my thoughts on three of them: Flower Market, Beach Walk and Funfair Evening, originally launched in mid-2012. All three fragrances were developed for Maison Martin Margiela by perfumers Jacques Cavallier and Marie Salamagne. Flower Market "carries the scent of fresh cut flowers in the buckets and vases of a Parisian flower market in 2011," and its composition includes notes of crushed leaves, freesia, sambac jasmine from India, Egyptian jasmine, tuberose, rose from Grasse, peach, cedarwood and oakmoss. I inhaled Flower Market hoping for the leaves and the roses to stand out — but what I got was mostly the freesia and a raw-edged jasmine, the kind that makes me feel slightly queasy. I eventually picked up on the tuberose, which also felt a bit rough and didn't seem to mix well with the weirdly intrusive peach note. Due to this oddly discordant and unfinished effect, Flower Market doesn't smell as sophisticated as it should. Then again, I haven't been to a Parisian flower market since 2003, so maybe things have changed. Beach Walk seems to be selling particularly well at my local Sephora stores, which makes sense for this time of year, since it is "inspired by a walk in the fresh ocean air of the Corsican beach of Calvi in 1972." It's composed with notes of bergamot, pink pepper, lemon, ylang ylang, Transluzone, heliotrope, coconut milk, musk, cedarwood and benzoin. Basically, this is an attempt to evoke the widely shared olfactory memory of suntan oil and salt air, and it does a competent job, although so many other brands (from prestige to indie) have already successfully bottled this particular smell that Beach Walk can't help but feel a bit redundant. Early in its development, there's an almost-dirty vetiver note that interests me — it reminds me of the boardwalk at certain East Coast beaches — but this element somehow fades away, leaving a more predictable citrus-ozone-coconut blend. Lastly (for today, at least), we have Funfair Evening, a fragrance that "evokes the sugary lightness of a Santa Monica carnival in 1994" with a composition of petitgrain, sweet apple, pear ester, star anise, neroli, Moroccan rose, tuberose, Egyptian orange blossom, Ambrox, white musk, Tahitian vanilla and caramel. By "caramel," we mean "ethylmaltol," of course. It's one of the dominant notes here, and once again, I wish I smelled more rose (or neroli or orange blossom), because what I ended up wearing was a confection of caramel, apple-flavored hard candy and licorice, dusted all over with a very synthetic musk. It did give me that feeling of a long, hot day at an amusement park, when you might have eaten too many of the wrong things and then ridden some regrettably topsy-turvy ride too soon afterwards...although I'm not sure this is what the creators intended. In case you haven't been able to guess, I ended up feeling annoyed by these fragrances. I liked Maison Martin Margiela Untitled well enough when it was released; it wasn't my style, but it felt like a smart, minimalist iteration of the "fresh" fragrance trend, and it didn't seem to be insulting anyone's intelligence. I can't really say the same for the Replica line (although, to be fair, I haven't tried the other three fragrances yet). All three feel like dull re-workings of ideas that have already proven to be successful — and, considering these Replicas are priced over $100, you might as well splurge on a travel-size bottle of Frédéric Malle Carnal Flower (if you really want a gorgeous tuberose bouquet), or pay significantly less for Prada Candy (if you're craving a sugary gourmand) or Bobbi Brown Beach (self-explanatory, and a best-seller since 2002). Or am I missing the point entirely? Have you tried any of these fragrances yet? What did you think? Maison Martin Margiela Replica Flower Market, Beach Walk and Funfair Evening are available as 100 ml Eau de Toilette ($125 each). This has been in Canada since it launched and we just received the new trio collection. The initial replica collection here is $113, so it’s shocking to see that it’s $125 in the USA. I can’t figure out how they got priced so high here. MM is not exactly a household name, and they’re just so shoddily done. I haven’t tried these at all, frankly because I don’t want to discover I like anything SO expensive. Or I guess enormous — I suppose if they came in a reasonable size the smaller bottles wouldn’t give me such sticker shock. Especially for a line like this, they should make everything in 15 ml minis and encourage people to buy them all. Actually, a set of minis for a reasonable price might be fun — although it wouldn’t fit the “luxury” category of MM, I suppose! Then again, the concepts for the individual scents aren’t very luxury, or avant-garde at all — so it’s a confusing collection in many ways. I agree with you. The concept behind the collection sounds nice enough, but these are all things that have been done before, and done better. Nothing exciting or innovative about these three. Haven’t tried the others, though. I have better hopes for Jazz Club. The Jazz Club tester was missing (shoplifted?) when I was in the store, so that one will have to wait for a future visit! Robin liked it more than any of the others, I think. I quite liked the Funfair one. I’v seen it described as a very inferior Angel, but personally I find that Angel is more likely to make me queasy! Funfair on me had a subdued sweet-twilight-at-the-funfair feel. Then again, my judgment at one testing is not something I would depend on! Funfair is definitely easier to wear than Angel — I really admire Angel, but it needs to be worn gently, and only in cooler weather! whereas you spritz Funfair without too much fear. It’s not dense or overwhelming. I do hope you review Jazz Club, that is one I’m interested in even though YSL already that one too, but maybe that is the point? The Margiela Couture collections are always made from recycled clothing and fabric found from all over the globe, so maybe their trying to recycle recent fragrance tropes. I do wonder what the real Martin Margiela is doing now since he left the maison? I’d *like* to think that this was some ironic conceptual project about recycling or appropriation, and that the Replica name is a joke, but I have a funny feeling that it’s just Diesel’s way of reaching vanilla/beachy/fresh fragrance-wearers…! I tried Funfair Evening at the Bay in Toronto a while back and thought it was very been-there-smelled-that. There have been far too many Angel clones over the last twenty-plus years for yet another to make an impact. I do like some Angel-influenced fragrances — I’m still a fan of the original Euphoria, and I thought Bond’s one or two takes on it were enjoyable — but this one is so kinda-Angel, kinda-Candy, and not particularly rounded or long-lasting, that is really does seem silly. I remember LUSH doing a carnival-inspired fragrance ages ago that was much cleverer. It was called Superworldunknown. I can’t believe you reviewed these today! I just picked up a sample at Sephora couple hours ago of the Funfair. I’m drawn to the carnival picture (I love amusement parks) on the box, the name of the fragrance and the idea. All of that appeals to me, and the reason why I got a sample. Not sure I’ll be a fan, though, as it smells as if I’m wrapped in a bunch of cotton candy. I guess you’d say this is a gourmand scent, yes? Yes, definitely a gourmand! due to the caramel/cotton candy note. I like the idea, too, but the execution just left me feeling kind of cheated and grumpy. The only scent from their house so far that I truly like is the Untitled EdP. I was tempted to get (read: Blind buy, as my local department store does’t carry these fragrances) Beach Walk and Funfair Evening but due to my skin being prone to amplify spices (pepper and anise = total enemies.) I kept away. Looks like I saved myself. I will be happy with my own Candy and Beach, Bronze Goddess etc. Thank you for this review Jessica! I liked Untitled, too — it made sense for the Martin Margiela brand, whereas these really don’t seem to, at all. And seriously, if you already own Candy and Beach or Bronze Goddess, you don’t need to acquire these. Jazz Club is the best of the batch.. hunt it down.. it is really good. I second that! It’s strangely nice. A good intro for someone wanting to get into boozy fragrances. Rum, smoke, vanilla. As soon as the tester reappears at my Sephora, I’ll ask for a sample! Sounds good. Things like this make me grumpy, too. I’ll rather take 1925 on the French Riviera, thank you (Jean Patou Chaldée in it’s 1985 incarnation). I’m planning to try the new JP Women’s Heritage version, too, but it’s $245 for 100 mls at Neiman Marcus. I hope it’s good, but if it is, the price of keeping great perfume alive is steep.